In her short little life so far, Parker has certianly changed all of our lives! She is sleeping through the night, generally from 10 to 5 am. This works out perfect because that is usually the time that I wake up for work! She is growing in leaps in bounds. 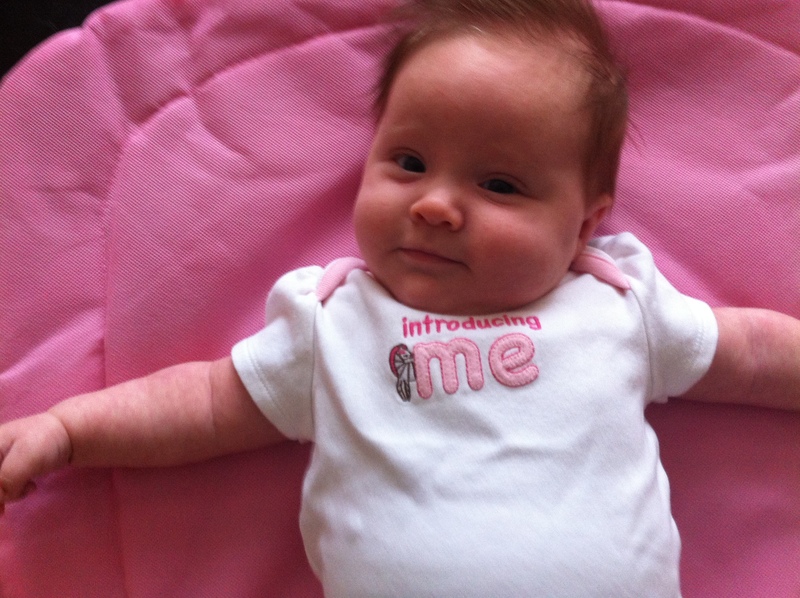 She is in size 3-6 month stuff, although she is still one week shy of 3 months! Here is the short version of her birth, as I haven’t been very good at blogging lately! But hey, can you blame me? I have been playing with this adorable baby all day long until this week when I had to go back to work! On November 28th, the Monday after Thanksgiving break, I woke up for work and went into the closet to pick my clothes out. When I turned around to walk out of the closet, my right leg gave out on me and I fell to the floor. Luckily I was in our carpeted closet. I wasn’t sure what to do. David heard me, came in there, helped me to my feet and put me in bed. Needless to say I didn’t go to work. That evening and the following morning my back hurt. Not a constant hurt, but on and off. I had heard of back labor and was worried. After a visit to labor and delivery, I learned that I was having irregular contractions and was 2 cm dilated. They prescribed medicene to keep the contractions at bay and sent me home on bed rest. After our pre-term labor scare, I did some grading from home to make sure my students finished out the quarter with fair grades and tried to rest. Those that know me, know that sitting at home doing nothing is like torture! We made two additional trips to Labor and Delivery before our final trip on December 30th. Very early that morning I began having more uncomfortable contractions that were 5-6 minutes apart and were not soothed with a warm bath, so we made what we thought might be yet another trip the labor and delivery only to be sent home. After being hooked up to all the monitors and being checked out, the nurse informed us that I was 5 cm dialated and that we would be having a baby!!! I cried. After weeks of waiting, we were going to have this baby! There were a few other ladies that were in more pain than I was, so we didn’t get into a room until about noon. My doctor was out of town and I was assigned to another doctor, which I wasn’t thrilled about, but she was great! She came in a little while later and broke my water and upped my pitocin dose. The very next contraction I knew we were doing this for real! What I had been experiencing prior to this point was just bad cramps compared to real contractions. I very quickly asked for the anesthesiologist in between leg shaking contractions. Within an hour I was in much better shape with an epidural. I nearly kissed the man when he walked in the door. Side note – the epidural man has the greatest job ever! I can’t imagine anyone is ever mad or upset when he walks in the room. At about 2pm they came in and we were at 10 cm and ready to push! After two and a half hours (much of which is a blur to me! ), she was born! They laid her on my stomach and left her there for a few minutes before getting her cleaned up and checked out. They handed Parker to David and he joined me at my bedside! This was probably the sweetest moment of the whole experience. I can’t tell you how proud he looked! I would go through all of the pre-term labor drama, multiple visits to labor and delivery, and labor itself just to see her in his arms with his face glowing!! In my exhausted haze, I took this picture to attempt to capture that moment. I wanted to bottle it up and made my very best attempt with my phone! God is so good! Just shy of two years after we lost our first little angel, we had a miracle in our arms!